*Author's Note: In response to the grief I've been given by posting the 'spoiler' of Star Trek Into Darkness on my private Facebook account I have opted to inform the reader that this review will give as many spoilers as possible. If one does not want to read them, skip down to the last paragraph and the conclusion. You have been warned. Thank you. I don't know if Star Trek Into Darkness is one of the most anticipated films of the year. However, for this film I did something I have not done in a long time: attend a midnight screening. The last time I did that was for 300 (and that was only because I was all but kidnapped into it). Two hours of screaming, heaving men...and I still struggled to stay awake. 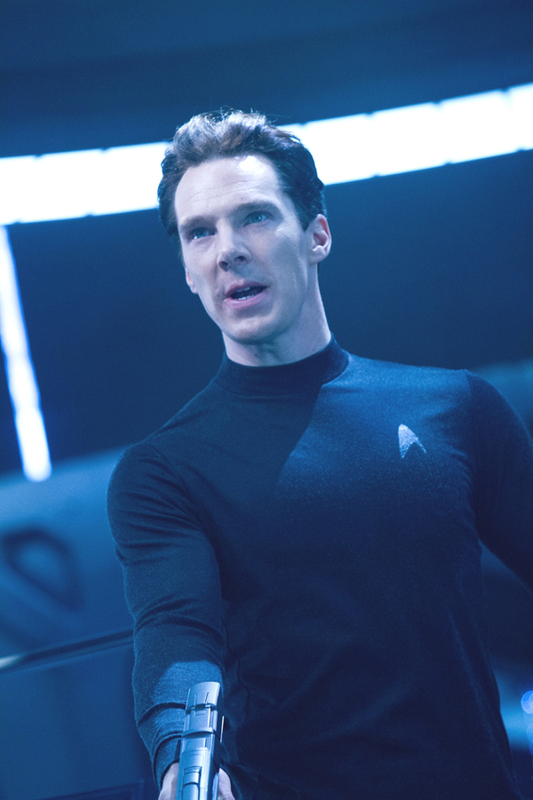 I was surprised by several things in Star Trek Into Darkness. I did not see people dressed up like Starfleet crew or Vulcans. The house was not sold out (there were several seats available, and I suspect the 3-D showing next door was the bigger hit). I did not hear applause at the end of the film. This is the short review version of the film: Star Trek Into Darkness is in all but name a remake of The Wrath of Khan with a bit of The Search of Spock thrown in for good measure. Here is the long version. Enterprise Captain James Kirk (Chris Pine) is on the planet Nibiru, one full of primitive people. Ostensibly there to survey the planet instead they quickly decide it needs to be saved from a volcano about to destroy it. However, a problem: the Enterprise (and crew) cannot be seen lest the Prime Directive (non-interference with the evolution of a species) be violated. Well, as Spock (Zachary Quinto) goes into the volcano, a series of events force the Enterprise to reveal itself by rising from the sea. Even though Spock is saved, the Vulcan is still miffed that the Prime Directive has been violated. As a result of Spock's report (which goes into greater detail than Kirk's), Kirk is demoted by Admiral Pike (Bruce Greenwood). Well, let us move onto other matters. There's a little girl dying in a London hospital, and a strange figure approaches the father, one Thomas Harewood (Noel Clarke). This mysterious figure promises he can save her with a little bit of his blood. All he has to do is a small favor...blow up the Starfleet Archives. Having thus launched a terrorist attack on London (not that such things ever happen in the British capital...perish the thought) an emergency meeting is convened. Here, we learn the name of this terrorist: John Harrison (Benedict Cumberbatch), a rogue Starfleet officer. No sooner has Kirk put two and two together than Harrison unleashes an attack on the meeting, killing Pike. With his mentor gone Kirk is giving permission by Admiral Marcus (Peter Weller) to go to Kronos, the planet of the Klingons, to capture Harrison who has been traced there. Of course, this must be done delicately, given that this pre-emptive strike (emphasis mine) could lead to war. Well, in Kronos despite the region Harrison is in being uninhabited the Klingons find the small crew of Kirk, Spock, and Uhura (Zoe Saldana). Uhura cannot convince the Klingons to help them capture Harrison but in jumps Harrison himself, wipes the Klingons, and surrenders. It's never a good sign when the villain surrenders and allows himself to be captured. It's also never a good sign when the villain is behind a glass cell where the heroes can be taunted by them. It just never is a good sign. We've seen it in The Avengers. We've seen it in Skyfall. Don't these heroes ever learn? In any case, Harrison taunts Kirk and reveals the whole nefarious scheme. He is a genetically enhanced super-being over 300 years old being used by Admiral Marcus as part of a secret weapons program to build weapons to destroy the inevitable war with the Klingons. Marcus has kept 72 of his people frozen, thawing only Harrison out to use his genius for the weapons, in particular a massive Federation Starship that will defeat them all. And his name is NOT John Harrison. 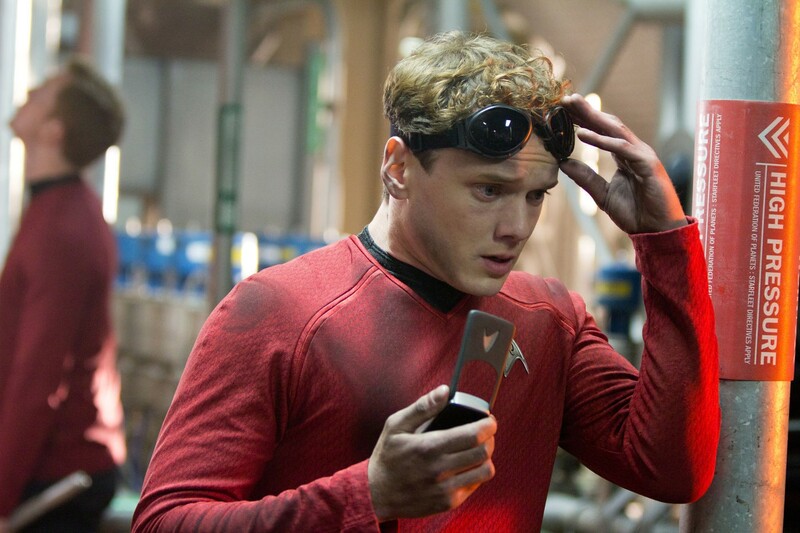 Now Kirk uses Montgomery 'Scotty' Scott (Simon Pegg), who had left the Enterprise when weapons he could not look into were brought aboard despite his strong objection, to find what exactly is located at the coordinates KHAN had given him. Here Scotty finds a shocking sight: a new Starship ready to go to war. It is the U.S.S. Vengeance, ready to attack the Enterprise to force them to hand KHAN over. 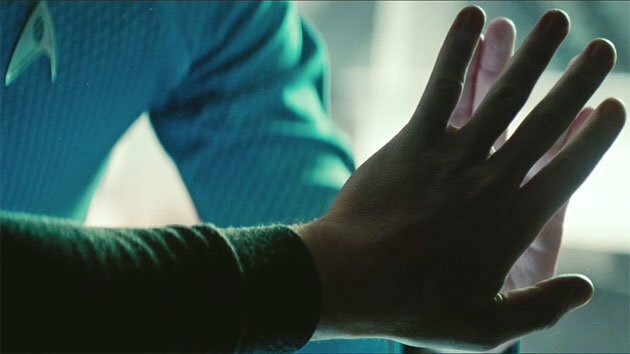 Once we learn who KHAN is, Acting Captain Spock (Kirk and KHAN going to attempt to stop Marcus aboard the Vengeance) does what any rational Vulcan would do...he calls his doppelganger (Leonard Nimoy) to find out if on THEIR parallel/alternate universe, they had ever encountered and/or defeated a KHAN. Even though Spock Prime tells Spock Alternate that he would never tell, he does so anyway. Allow me to stop for a moment and ask, isn't that cheating? Well, anyway KHAN and Kirk get on board the Vengeance, where while Marcus is defeated KHAN still holds the upper hand. Hand over his cryogenically frozen men, or Kirk dies. While Spock relinquishes, KHAN still won't surrender his mad dreams of frankly I don't know what. However, a little bait and switch: while the torpedoes that held KHAN's people were sent, they remained on the Enterprise. The torpedoes were activated, fatally crippling the Vengeance. In any case the Enterprise has been fatally damaged as well, plummeting towards Earth. Only one thing can stop it: repair the warp core, even if it means enduring massive radiation. If by this point you think the one who makes the greatest sacrifice is Spock, you've been watching the wrong movie. In Into Darkness, it is KIRK who goes in. It is KIRK who is behind the glass, radiation overwhelming him. It is SPOCK who stands unable to save his friend. It is SPOCK who sheds tears. And it is Spock who screams out, "KHAAAAANNNN!" Kirk is dead, but WAIT! Dr. McCoy (Karl Urban) notices that the Tribble he has, which he injected with KHAN's blood, is now alive. Would that not work with our beloved Captain? Well then, only one thing for it: they have to get KHAN alive. Fortunately, even though the Vengeance crashed into San Francisco (glad we can now reference September 11th without anyone really raising any objections of seeing ships crash into buildings and whole populations), KHAN escapes without a scratch. Spock now goes after him and with a little help from his girlfriend manages to stop KHAN, get the blood, bring Kirk back to life, and freeze KHAN again, with everyone aboard the Enterprise ready to begin their five-year mission (except for crabby Dr. McCoy). Unlike Trekkers/Trekkies, I am not upset or angered by the appearance of KHAN in Into Darkness. I'm not bothered by including his character in this movie. I am HIGHLY upset and angered that I am asked to watch a virtual remake and have people tell me I am watching something original. That more than anything else damns Into Darkness for me: the idea that director J.J. Abrams and screenwriters Roberto Orci, Alex Kurtzman, and Damon Lindelof (who brought us Star Trek, a film I feel I need to reevaluate after this debacle) could basically rip off another film in the Star Trek canon and no one either notice or care. It is just bad enough that they all but stole all of Wrath of Khan, but that they have similar scenes, plot points, and even imagery from Wrath of Khan. No sensible person could possible have thought that seeing a character yell out "Khan!" after his friend dies from an overdose of radiation would not have them think of Wrath of Khan. Into Darkness might work for those who pretend that everything before the reboot did not exist (a bit like Doctor Who fans who think the show started with 2005's Rose and that nothing starting from 1963's An Unearthly Child to 1989's Survival or 1996's Doctor Who: The Movie relates to the show they watch now...even while they proclaim the 50th Anniversary of a show whose first forty years they neither know nor care about). However, for those who know of that iconic line reading, or who know of Spock's great sacrifice in keeping with Vulcan thinking that "the needs of the many outweigh the needs of the few, or the one", Into Darkness is nothing more than a shameless rip-off. There is no other term for it: Star Trek Into Darkness is a shameless rip-off of Star Trek II: The Wrath of Khan. Star Trek Into Darkness even manages to steal a bit from Star Trek III: The Search For Spock. In that feature, the whole story revolves around the efforts to bring a believed-dead Spock back to life. In Into Darkness, it happens in the last ten minutes, in a clumsy way (I know there is Power in the Blood, but this is ridiculous), and in a way that robs us of the emotional impact that Spock's 'death' had on the viewer in Wrath of Khan. In short, you just can't basically copy another film in the same franchise and expect to get away with it with the excuse of 'it's an alternate universe'. If it is an alternate universe, then why does Spock Alternate (Quinto) call on Spock Prime (Nimoy) to basically give him a crib sheet as to A.) who Khan is and B.) whether he was defeated? Wouldn't it be obvious if Spock Prime is still around that the answer to B. is in the affirmative? I found that both despicable (rather than have YOU, Spock Alternate, find things out, I, Spock Prime, will just tell you about it) and illogical. Why would Spock call on Spock to give him information? As a side note, we get a little rip-off of all things of The Poseidon Adventure. The only thing missing was Shelley Winters, but I digress. There are other things I disliked about Into Darkness (though the shameless rip-off of Wrath of Khan was probably the biggest thing). The Klingons were either an afterthought or a way to bring them in for the inevitable sequel because they were irrelevant to Into Darkness (any alien group could have been there). Moreover, while their new design doesn't particularly bother me I am not crazy about it either. Another bad aspect is in trying to make us sympathetic to Khan. He cries when monologuing about how he's been used by Marcus, but again, it's hard to gain sympathy from someone we barely know. At least with Ricardo Montalban's Khan we at had a reason for his pathological hatred of Kirk. With Cumberbatch, despite his best efforts I didn't care about him or his people. Moving on with the performances, Cumberbatch was directed to emphasize his luxurious baritone to full 'villain' effect. Whenever he spoke, he used his voice to signal, 'I'm a villain, a super-villain, a mad genius'. However, I always have an antipathy whenever an actor deliberately uses his voice to signal that he is evil. Cumberbatch's Khan, despite the script's desperate efforts, never came across as particularly dastardly or dangerous or menacing. He was imposing in his stillness, but whenever called on for an actual threat Khan and Cumberbatch were almost a secondary plot device given that the real villain was Marcus and his George W. Bush-like rush to war at all costs. However, what makes Into Darkness at least bearable is most of the Enterprise crew. 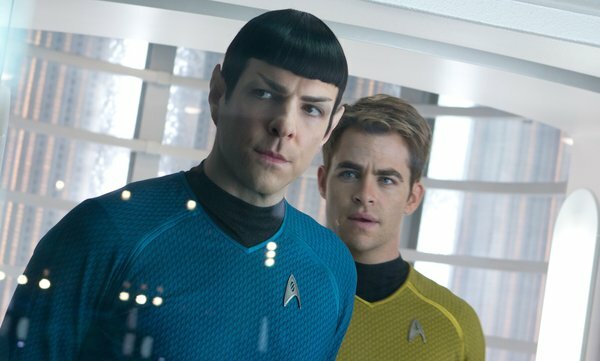 Of particular note is the interplay between Pine's Kirk and Quinto's Spock. Both work very well together to where they compliment each other's character: the arrogance and ego of Kirk tempered by Spock's logic, and Spock's somewhat cold nature guided to a sense that logic is not the answer to everything by Kirk's instincts. Their scenes together are one of the few bright spots in Into Darkness (no pun intended). Even though he is criminally underused Karl Urban still has the best moments as the cantankerous McCoy, even tipping his hat for original McCoy DeForrest Kelley's infamous, "Damn it, I'm a doctor, not a...". Here, it is to Spock that he speaks, "Damn it, man. I'm a doctor not a torpedo detonator." Quinto is also strong as Spock, even though I would argue he's less Vulcan and more (horrors) human in his interpretation. As a side note, despite the determined efforts to have a Spock/Uhura romance (one of the few things I felt failed in Star Trek), the 'comedic banter' between a bickering Uhura and Spock as they come to the Klingon planet of Kronos struck me as both idiotic (it really is the worst time to start a fight) and unrealistic, even almost sexist (note the woman is the one who started it). My view of Saldana's Uhura is becoming more tempered, even if she had little to do. At least in the female department it was better than Alice Eve's Carol Marcus, the Admiral's betrayed daughter. What she was we call 'eye candy' and a set up for Kirk's son should they opt to remake Search for Spock and The Undiscovered Country as they've remade Wrath of Khan. It was an unfortunate decision to sideline Urban for Simon Pegg, whose Scotty came off as a manic comic relief with illogical plot points to boot. I kept wondering how no one on the Vengeance failed to notice this annoying Scotsman running around the ship causing havoc. Furthermore, there really was little point of having Scott leave the Enterprise since they could have worked the situation in another way (though the flight of Kirk and Khan across space between the Enterprise and the Vengeance was a beautiful-looking highlight of the film). This 'get Scott out to make him a more important character' not only forced us away from Urban's McCoy but also generally sidelined both John Cho's Sulu (sorry all these years I thought your character's name was Zulu) and Anton Yelchin's Chekov (who was pushed into Engineering and was made to look almost inept if not downright stupid, a kid who didn't know the first thing about how to get the Enterprise moving). As I watched Star Trek Into Darkness or as it should be titled, Wrath of Khan: The Remake I could not help think that I had been had, hoodwinked, bamboozled, led astray (thank you, Brother Minister). There is simply no reason, no excuse, nothing that can be said to justify attempting a reboot while at the same time dragging the past in front of us (and dragging the legacy of what has come before through the mud, as if Wrath of Khan had never happened). If anything Star Trek Into Darkness is NOT the highly-touted reboot of the Star Trek franchise we were promised. Instead, Star Trek Into Darkness is a horrid pillaging of what has come before and a case that those behind this reboot either simply have no ideas or have decided that they can copy and paste and no one will notice or care because it's in an alternate universe. Star Trek Into Darkness does have good things in it (Quinto and Urban are the best performances in the film, some of the action sequences are well-made), but frankly it is too evocative of other, better films to be a Star Trek film I would want to watch over and over for pleasure. This is not the best Star Trek film, not by a long shot. I question whether it is even a Star Trek film, except in name, and if anything, Star Trek Into Darkness teaches us the importance of names. I was in picture too.